It crept in slowly, like a pebble wedged in the toe of my shoe that I’d only feel occasionally. If I moved a certain way — or, in this case, if I caught a certain scroll, pin or post – then there it’d be, a tiny stab of insignificance. I’d brush it aside, thinking maybe I was just jealous or being judgmental, giving too much room to those self-centered tendencies we can have as human beings. But it started getting worse. What’s more, I started getting worse. I was becoming annoyed and cynical with anything new, anyone billing themselves as artistic or creative or living their best life. As ugly as it sounds, I’ll admit: I’ve internally rolled my eyes more times in the last year than maybe ever as an adult. Pride is a nasty root. And underneath its web, there’s usually something more. For me, what lay beneath was insecurity (shocker — despite my firm belief that it’s a great decade, how many women can’t relate to self-doubt in their 30s?). Insecure that I wasn’t on track. Insecure that I was losing relevance in friend groups. Insecure that time was slipping away and I was just wasting it. All of it. How does Italy fit in? From the outside, you’d never expect it. That’s what’s great about being different, isn’t it? Pulling up (or walking up — its location is conveniently walkable) to Villa Tra’monti in Bassano del Grappa doesn’t achieve the assumed grandiosity of saying you’re off “to vacation in a villa in Italy.” You don’t weave up an exclusive drive and a liveried service staff isn’t standing at attention. Instead, you turn off the main road and immediately to your left, as if still on the off-ramp, you arrive at the front gate. The stone structure with its mid-century modern, almost commanding silhouette slices itself into your view of the mountains, now an ombre blue against the sunset in the distance. I’m welcomed by Carolina, who owns and runs the villa and is apologetically distracted; a hailstorm tore through the night before and her plants, which frame the perimeter of the property, remain in critical condition. The door handle is old, she says, so only use the key. She twists the lock and pushes the iron grate. Immediately, I get the sense I’ve just entered someplace special. There’s a warm glow as the setting sun — still infusing the living room’s pink sofa and matching armchairs — spills onto the wood-paneled floor at our feet. It’s the best kind of light. I decide I’d happily camp in the entryway if I could. But I can’t. Carolina leads me to the kitchen where the color palette changes from pink to yellow. The walls are tiled and there’s a vintage yellow fridge in the corner, not the ironic kind. A bottle of prosecco with my name on it chills inside, awaiting a later pour. I’m invited to use the kitchen at leisure with the only reminder to segment my trash for recycling. It’s a green home, she says. The green energy is important. As we wander back through the rest of house, Carolina explains how her father collected art. Uniquely chosen, every piece in her home — some dating back to the 17th century — has a story. Originally just two floors, two additional levels were added to the villa in the 1950s; not the top two, as you might expect, but the bottom two. Italian architect Francesco Bonfanti guided the project. Depth was carved out intentionally. I note the life metaphor and follow Carolina down the arched corridor to my room. Over the next five days, whether waking up jet-lagged to lavender skies and the swaying cypress trees outside my window or coming back to the villa mid-day to rest my blistered heels (and cursing for not packing sandals), I settle into the stillness of Villa Tra’monti. It’s ironically active with something I can’t put my finger on. The pattern on a table runner. A collection of vintage books behind a curtain. 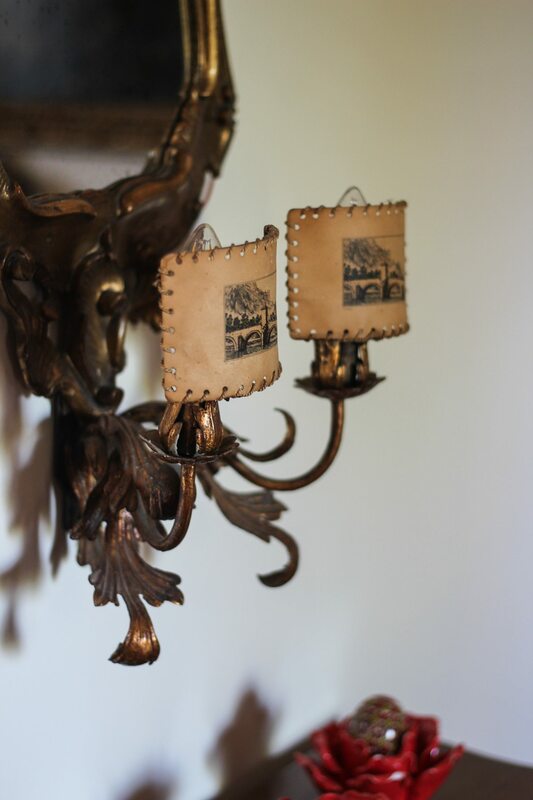 The detail on a wall sconce. My eye seems to find the things that aren’t asking for attention. Appreciation is the reward and there’s a sense of refreshment edging in. Eventually, it hits me: I didn’t know how much I needed to see a place like this. That was unapologetically itself. Where time is an art form instead of a burden. I’m not just talking about the magic of Italy in general, that’s well-documented, but being in a home with a unique sense of collection. The villa isn’t trying to be anything but what it is and in doing so, it invites you to disarm a guard of ineptitude. You, too, have details waiting to be discovered. It’s the parts that feel different that end up being distinct. And it’s the view from the shared balcony that really cements this for me. Looking out over the edge of historic Bassano, I’m reminded that creativity by nature (and just like nature) cannot be compared. A deep sense of self is synonymous with significance. When we’re not striving to keep up, we can offer something new. Something imaginative and truly beautiful. Ourselves. That’s what we share. That’s what inspires. That’s where we rest. It’s the fullness of our stories, with all their unexpected storms and stand-alone colors, that’s truly the reward. P.S. I haven’t felt the pebble since. Villa Tra’monti hosts three rooms year-round. Contact for availability by emailing villatramonti@gmail.com or reserving on AirBnb here. Heart-bursting Zizavita. Feeling the “travel drunk” way more than I thought I would about DK, but it was SO worth every second. I found that getting away just about anywhere thats not home, helps me reconnect with parts of myself I just kind of pushed aside. I’d love to go to Italy or somewhere in Europe some day! I’ve heard that pretty much every culture thats not american has a much slower pace of living. I relate to moments tied to the place that you are in, that bring in a new, much needed perspective – I recently wrote about a similar experience. Yes! Adventuring and exploring are so good for the heart. Thanks for sharing! Thank you for bringing in this beautiful place. Your descriptions took me there and will linger on. This villa must have a very, very special place in your heart now. I’d love to see a place like this, a place that speaks so powerfully to me that it transforms my mindset, too!